While it's common to give devices and accessories related to the iPhone, iPad, and iPod touch as holiday gifts, the idea of giving apps as gifts is less common — but that doesn't mean it's less of a good idea. Sure, it doesn't make sense to give a free app; anyone can download those. But paid apps that cost $1, $3, or even $10 can be just as valuable a gift as a gift card or other accessory. In the same way that giving music and movies through the iTunes Store is pretty easy, giving apps is easy, too. Here's what you need to do. Tap the App Store to launch it. Find the app you want to gift by browsing or searching. Tap the app to go to its detail page. Tap Gift in the pop-up menu at the bottom of the screen. 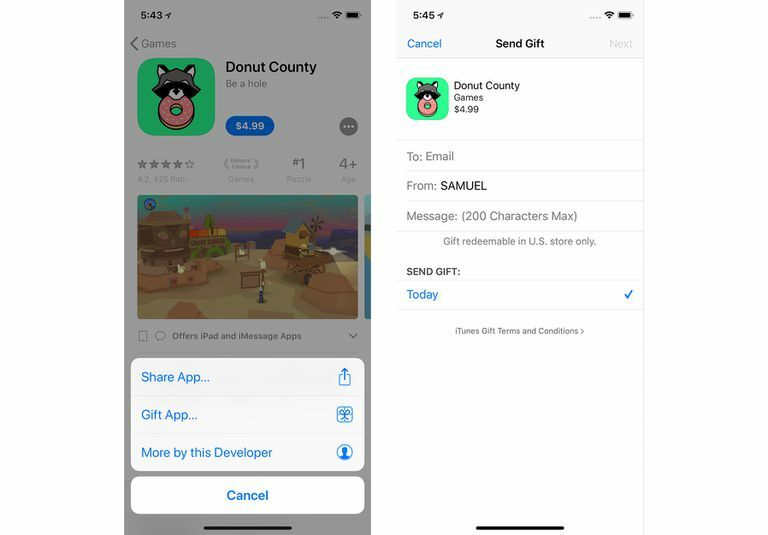 Not every app can be given as a gift, so if you don't see this option, the app likely can't be gifted. Enter the email address of your gift recipient, your name, and a message. In the Send Gift menu, sending the gift today is the default. To change that, tap the menu and select a new date. Swipe side to side to preview the gift email styles. When you find one you like, keep it on screen and tap Next. On the final screen, review all details of the gift. To make changes, tap Back. To Buy the gift, tap Buy. With the removal of the App Store from iTunes 12.7, you can no longer give apps as gifts using iTunes. If you've got an older version of iTunes, you can follow the steps listed below, but otherwise giving gifts from iOS devices is the only option. Open iTunes and make sure you're logged into your iTunes account (or, if you don't have one, create one. You'll need to do this in order to pay for the gift). Search or browse the App Store until you find the app that you want to give as a gift. Click the down arrow next to the price of the app. In the menu that pops up, click Gift This App. In the window that pops up, fill out the recipient's email address, your name, and a message to go along with the gift. Next, choose whether to send the gift by email today or on another date. If you select a future date, an email containing the gift will be sent to your recipient on that day. On the next screen, you can choose the style of the email that includes the gift. Select your style from the list on the left. If the preview of the gift email looks good, click Next. Review the gift, price, and other details. To change something, click Back. To buy the gift, click Buy Gift.